The hospitality industry is growing worldwide with the expansion of the travel industry. Take advantage of the many lucrative teaching opportunities within this field and become certified to teach Hospitality English. Topics include the hospitality industry, employment opportunities, job training in English, and vocabulary for the industry and teaching methods. Hospitality English provides the TESOL teacher with the necessary skills and resources to begin teaching within this worldwide-growing industry. 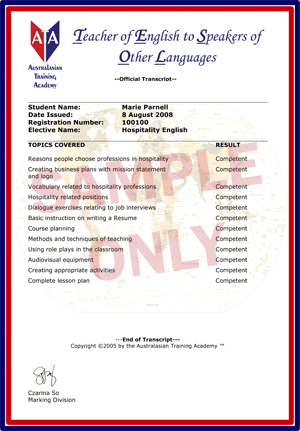 Q: Do I need to have worked in the hospitality industry to teach Hospitality English? A: No, all that is needed to teach in this ESL field is provided in the course.